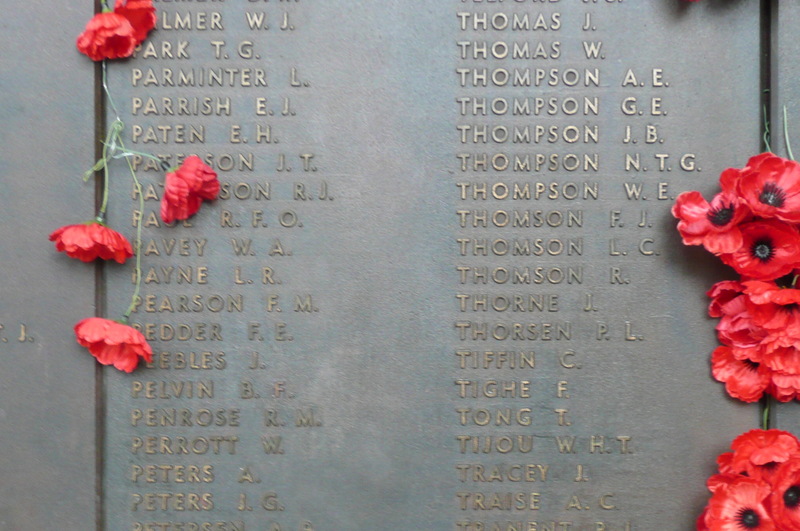 James Thomas Paterson’s name on the memorial boards at the AWM. A couple of my family’s fallen Diggers, James Augustus Gavin and William Rudolph (Robert) Kunkel, were remembered in earlier posts. Today I want to focus on the service of the Australian Diggers in World War I who were descendants of the mid-19thcentury Dorfprozelten immigrants, five of whom gave their lives and another 17 served in the Australian forces and two earned bravery medals. In this photo of a young Ken Kunkel in uniform he is a ringer for my father, or I suppose vice versa. Does anyone know what the shoulder flashes signify? As far as I can tell none of their living parents and grandparents were interned but there was a requirement for them to report to the local police regularly. Interestingly George Kaufline (son of Dorfprozelten couple Vincent and Eva Kauflein) remained Mayor of Cooma during the war despite his German ancestry. 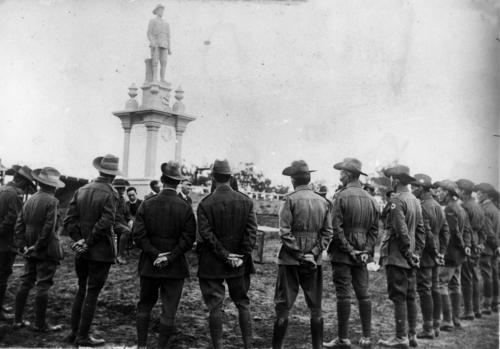 Returned soldiers in uniform surrounding the Digger War Memorial in Chinchilla ca. 1920 SLQ image 4579, copyright expired. 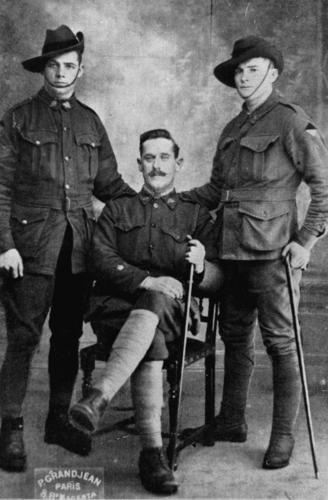 Corporal Zeller of Dalby, Sgt Major Leaver and Sargeant Concannon of Maryborough. photographed in France during WWI. SLQ Negative number: 109996 copyright expired. This is probably George Herbert Zeller, the only one to become a Corporal. RIP: Thomas Zeller (29) enlisted 8 March 1916 in the 15th reinforcements of the 26th Battalion. He assured the enlisting officer that he was willing to sign a declaration that both his parents were born in Australia. Thomas was killed on 7 October 1917 in the prelude to the battle of Passchendaele, though his death was not confirmed until 15 April 1918. He was buried in the Tyne Cot cemetery, north-east of Ieper. There is a very evocative letter from John Zeller to the military asking for confirmation of his son’s body being found and buried because “his mother is heartbroken at the thought that no one saw him dead”. The pathos of these letters from families desperate for any small piece of information on their loved ones is heart-tugging even at this distance in time. RIP: George Herbert Zeller (22) enlisted on 28 June 1915 in the 3rd reinforcements of the 25th Battalion. George was killed on the Western Front on 9 April 1918. He was “very smart and a good soldier. Won his corporal stripes with his Lewis Gun in which he was highly proficient.” George was buried in the Warloy-Baillon Communal Cemetery extension, north-east of Amiens. 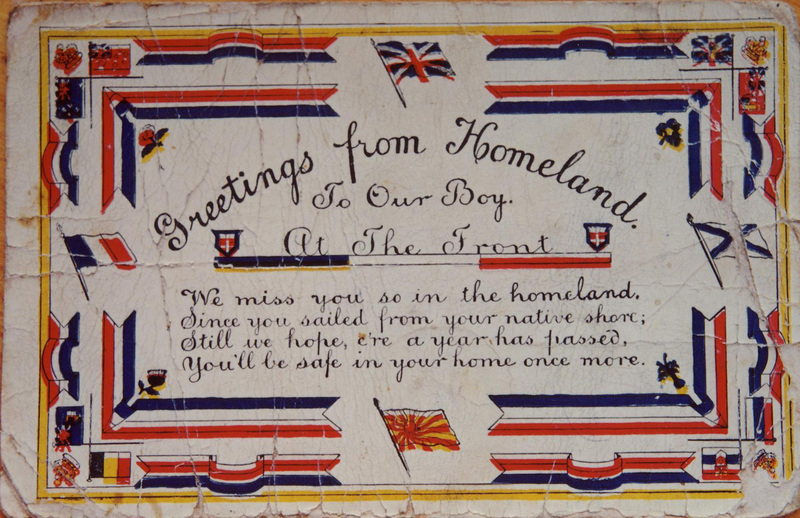 A postcard sent to Ken Kunkel at the front by a young nephew. Alfred Zeller (27) enlisted with the AIF on 14 November 1916 in Toowoomba. Originally with the 19th reinforcements of the 25th Battalion, he was later attached to the Engineers. Richard Zeller (32) enlisted on 14 November 1916 in the 12th Machine Gun Company and was later transferred to the 47th and then the 42nd Battalions. Children of Joseph and Caroline Worland, grandchildren of Vincenz and Eva Kauflein(aka Kaufline) from Dorfprozelten. 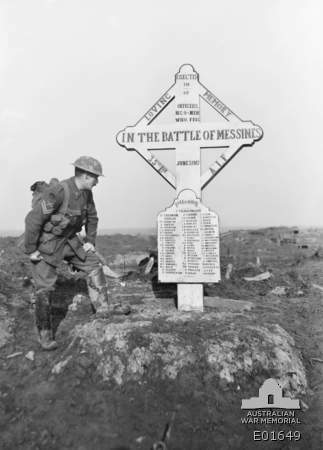 http://www.awm.gov.au Image EO1649 (copyright expired) Menin Gate memorial memorial erected near Ash Crater to members of the 35th Battalion who fell in the battle of Messines on 7 June 1917. R C C Worland’s name is on this memorial. RIP: Robert Charles Clyde Worland (20), from the Cooma/Monaro area, enlisted on 7 August 1916 and served with the 35th Battalion. He was killed in action on 10 June 1917. He is remembered on the Ieper/Ypres (Menin Gate) memorial. RIP: Lt Edward John Worland MC (31) enlisted on 24 November 1915 and served with the 35th Battalion . He was twice recommended for the Military Cross (July and August 1918) which was awarded 1919. He was killed in action on 30 August 1918 and is buried in Daours Communal Cemetery Extension, about 10km east of Amiens. The youngest son and a grandson of Heinrich Volp[ii] and Anna Günzer (aka Ganzer). Anna was only a young woman of 14 when she emigrated from Dorfprozelten. George Volp MM (son of the above, 22), enlisted in February 1917 and was with the 25th reinforcements of the 2nd Light Horse. George was recommended for the Military Medal in November 1917 and awarded it in January 1918. Henry Ernest Volp (23) was the grandson of Heinrich and Anna and the son of their eldest son Johann Jacob. He also enlisted with the 25th reinforcements of the 2nd Light Horse in February 1917. It seems likely these two men, born in the same year, were more like brothers than uncle and nephew. Son of Christopher Ganzer and his wife Ellen Gollogly and grandson of Dorfprozelten immigrants George Günzer (aka Ganzer) and his wife Hildegardis Hock. George Günzer was the father of Anna Günzer above, so even though he was deceased well before WWI he had at least 3 grandsons serving. 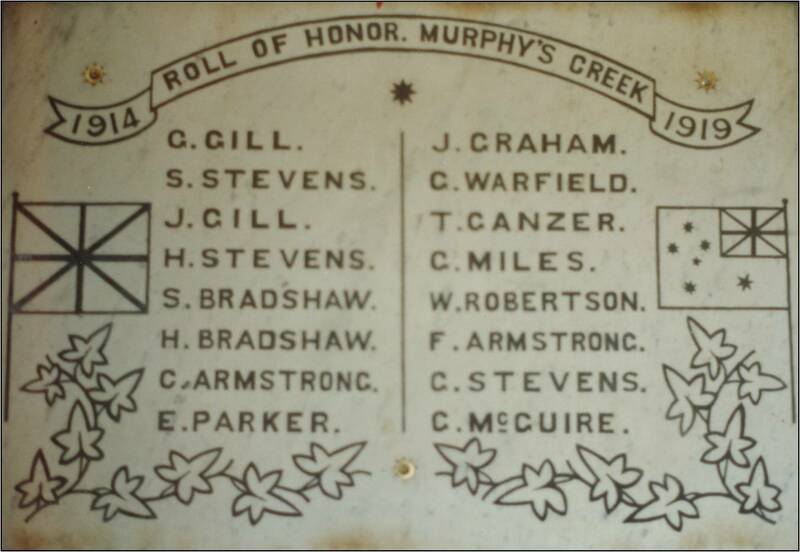 The Murphys Creek (Qld) World War I Memorial Board taken P Cass c1988. Terence Joseph Ganzer (21 ) enlisted on 17 November 1916 and served with the 24th reinforcements of the 5th Light Horse. Grandchildren of Bavarian-born George Mathias Kunkel and his Irish-born wife, Mary O’Brien, from Murphy’s Creek and sons of George Michael Kunkel and his wife Julia Gavin. 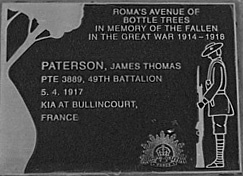 RIP: James Thomas Paterson (28) enlisted on 31 August 1915. He had previously served with the Roma Commonwealth Light Horse. Initially James was posted to the 9th reinforcements of the 25th Battalion but on arrival in Egypt he was absorbed into the 49th and later attached to the 50th. James served on the Western Front and on 5 April 1917 he was killed during an assault on a railway crossing near Noreuil. His body was never recovered and he is remembered on the Villers-Brettoneux memorial near Amiens. James left behind a wife and infant daughter. Daniel Joseph Paterson[iii] (24) enlisted on 25 February 1917 and initially attached to the Machine Gun Company then subsequently the 31st and 41st Battalions. 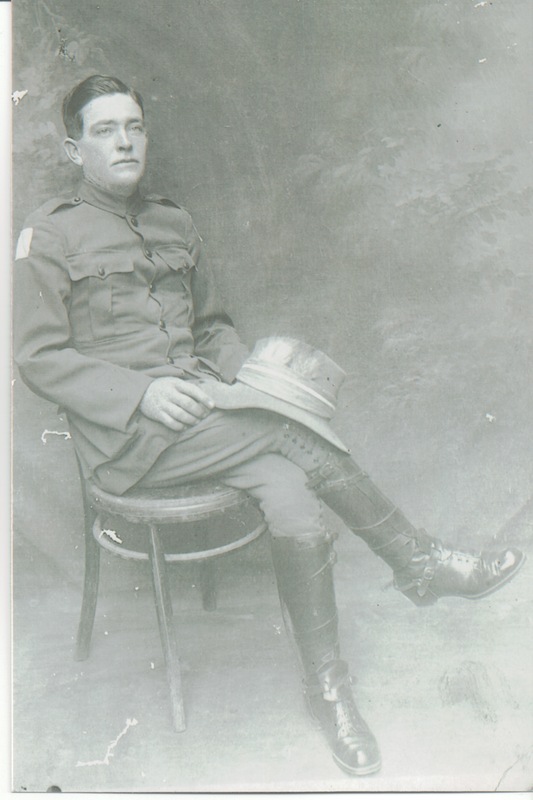 He served in France but was repatriated to England in mid-1918 with trench fever. He must have been quite sick as he did not return to France for over two months. According to family anecdote, Dan had a lifelong aversion to war. Young brothers Matthew David John Kunkel (22) and Kenneth Norman Kunkel (20) had already enlisted in January and February 1917. Two of their Gavin cousins left on the same ship with them and one had already given his life at Fromelles. John’s file is annotated with the comment “I have examined papers in every respect”. 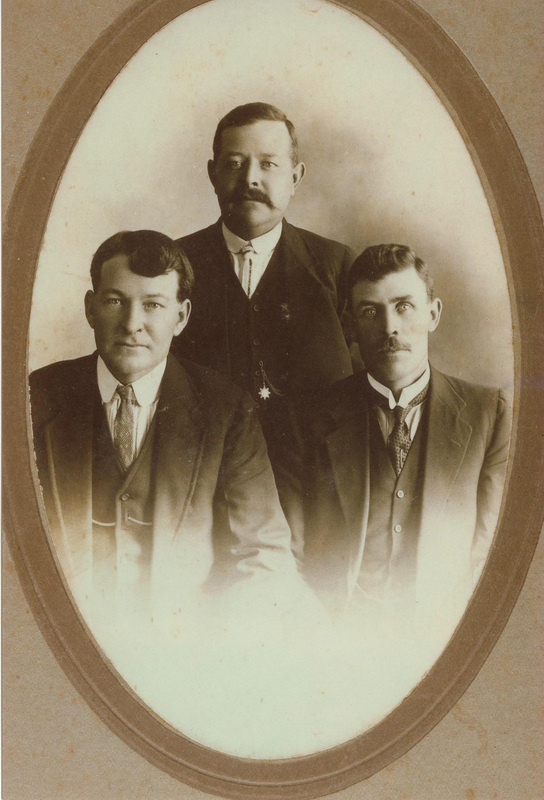 James Edward (Front left) and Denis Joseph Kunkel (centre) and unidentified friend or relation c1917. John and Ken’s older brothers Denis Joseph Kunkel (37), my grandfather, and his brother James Edward Kunkel (26) enlisted on 22 October 1917 when the call went out for experienced railwaymen to work on the lines in western France. James Edward was subsequently rejected on the grounds of ill health, but Denis Joseph Kunkel joined the Australian Broad Gauge Railway Operating Company in north-west France and Belgium. His service file carries a muddle of papers including those of two of his brothers. Despite a view that being in the railway unit was an easy life, it’s unlikely it seemed so when the German heavy guns got a line on the trains delivering replacement armoury. Mathews, T. op cit, page 365. On 2 July 1918, Boulogne, LHA Giles 25th Battalion. [i] It’s possible there may be more descendants of these families who served as it’s some years since I followed them in detail. I would be very interested to hear from anyone who can add to this list. [ii] The children of this family are on the Qld BDM indexes with the surname Folp, reflecting the German pronunciation. Anna was only a young girl when she arrived from Germany and she had many children. This entry was posted in Brisbane, Dorfprozelten research, Family History, Kunkel Family History, Military, Murphy's Creek, Queensland, Queensland Rail, World War I, World War II and tagged Alfred Zeller, Ann Nixon, Christopher Ganzer, Daniel Joseph Paterson, Denis Joseph Kunkel, Edward John Worland, Ellen Gollogly, Eva Kauflein, George Günzer, George Herbert Zeller, George Kaulfine, George Kunkel, George Volp, Henry Ernest Volp, Hildagardis Hock, James Edward Kunkel, James Thomas Paterson, John Zeller, Kenneth Norman Kunkel, Mary O'Brien, Matthew David John Kunkel, Richard Zeller, Robert Charles Clyde Worland, Terence Ganzer, Thomas Zeller, Vincent Kaufline, Vincenz Kauflein, World War I by cassmob. Bookmark the permalink. It is only a guess but as he doesn’t have any collar flashes may signify he is enlisted but not assigned? Regimental Books ( http://regimental-books.com.au/) have been very helpful to me in identifying uniforms and badges on their Facebook page. It would be worth asking the question with the picture on their page. Thanks Helen…that’s a good tip. I’ll follow it up. Thank you so much for sending this. It has made my day. Perhaps a little contentious but it is part of Australia’s military history…they were Aussies by then and I think the German Catholics were less separated from the rest of the community … But that’s my perspective. I also think 2 bravery medals from 17 enlistments is pretty good. Loved the tribute and the pictures! And after I googled “Digger” I was right in the groove. And 2 bravery medals out of 17 is indeed impressive. Thanks Joan….sorry to muddle you with “Digger”. Thank you for this information. My grandfather is Terrance Joseph Ganzer born in Murphy’s Creek in 1895. He is the one mentioned joining the 25th reinforcements to the 5th Light Horse. He also served as a police officer before and aft the war. I have contacted this page before, about the Kunkle ANZACS. We at the Logan Village Museum have them listed as part of our ANZAC display because of their connection to Jimboomba.